"Let us contemplate the joys and sufferings of the heart of St. Joseph, the heart that place the gift of himself totally at the service of the work of salvation. The heart that participated in this plan with the total and complete gift of his self oblation for the Mother and the Child; and found in this vocation of oblation, the most sublime and elevated realization of his humanity and his masculine heart." It is as follows: Two Fathers of the Franciscan order were sailing along the coast of Flanders, when a terrible tempest arose, which sank the vessel, with its three hundred passengers. The two Fathers had sufficient presence of mind to seize hold of a plank, upon which they were tossed to and fro upon the waves, for three days and nights. In their danger and affliction, their whole recourse was to St. Joseph, begging his assistance in their sad condition. The Saint, thus invoked, appeared in the habit of a young man of beautiful features, encouraged them to confide in his assistance, and, as their pilot, conducted them into a safe harbor. They, desirous to know who their benefactor was asked his name, that they might gratefully acknowledge so great a blessing and favor. He told them he was St. Joseph, and advised them daily to recite the Our Father and Hail Mary seven times, in memory of his seven dolors or griefs, and of his seven joys, and then disappeared. St. Joseph, Chaste Spouse of the Holy Mother of God, by the sorrow with which thy heart was pierced at the thought of a cruel separation from Mary, and by the deep joy that thou didst feel when the angel revealed to thee the ineffable mystery of the Incarnation, obtain for us from Jesus and Mary, the grace of surmounting all anxiety. Win for us from the Adorable Heart of Jesus the unspeakable peace of which He is the Eternal Source. St. Joseph, Foster-Father of Jesus, by the bitter sorrow which thy heart experienced in seeing the Child Jesus lying in a manger, and by the joy which thou didst feel in seeing the Wise men recognize and adore Him as their God, obtain by thy prayers that our heart, purified by thy protection, may become a living crib, where the Savior of the world may receive and bless our homage. St. Joseph, by the sorrow with which thy heart was pierced at the sight of the Blood which flowed from the Infant Jesus in the Circumcision, and by the joy that inundated thy soul at thy privilege of imposing the sacred and mysterious Name of Jesus, obtain for us that the merits of this Precious Blood may be applied to our souls, and that the Divine Name of Jesus may be engraved forever in our hearts. St. Joseph, by the sorrow when the Lord declared that the soul of Mary would be pierced with a sword of sorrow, and by thy joy when holy Simeon added that the Divine Infant was to be the resurrection of many, obtain for us the grace to have compassion on the sorrows of Mary, and share in the salvation which Jesus brought to the earth. St. Joseph, by thy sorrow when told to fly into Egypt, and by thy joy in seeing the idols overthrown at the arrival of the living God, grant that no idol of earthly affection may any longer occupy our hearts, but being like thee entirely devoted to the service of Jesus and Mary, we may live and happily die for them alone. St. Joseph, by the sorrow of thy heart caused by the fear of the tyrant Archelaus and by the joy in sharing the company of Jesus and Mary at Nazareth, obtain for us, that disengaged from all fear, we may enjoy the peace of a good conscience and may live in security, in union with Jesus and Mary, experiencing the effect of thy salutary assistance at the hour of our death. St. Joseph, by the bitter sorrow with which the loss of the Child Jesus crushed thy heart, and by the holy joy which inundated thy soul in recovering thy Treasure on entering the Temple, we supplicate thee not to permit us to lose our Saviour Jesus by sin. Yet, should this misfortune befall us, grant that we may share thy eagerness in seeking Him, and obtain for us the grace to find Him again, ready to show us His great mercy, especially at the hour of death; so that we may pass from this life to enjoy His presence in heaven, there to sing with thee His divine mercies forever. 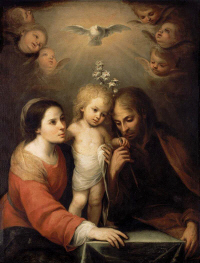 O God, Who in Thine ineffable Providence has vouchsafed to choose Blessed Joseph to be the Spouse of Thy most holy Mother; grant, we beseech Thee, that we may deserve to have him for our intercessor in heaven whom on earth we venerate as our holy protector: Who lives and reigns forever and ever. Amen.